In DISNEY’S FOUR-COLOR ADVENTURES, BOOM Kids! cracks the Disney vault to find some of the rarest Disney comics ever created. 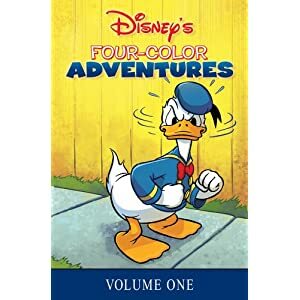 This volume features classic Disney comics and gag strips, from such creators as Al Taliaferro, creator of fan-favorite characters Huey, Dewey and Louie, “Disney Legend” Jack Hannah and more, reprinted for the first time in decades. Al Taliaferro began working as a comic strip penciler in 1934. His early comics work involved Bucky Bug and other Silly Symphony Sunday characters. In 1938, he started the first Donald Duck newspaper strip. Within that strip, he created many fan-favorite duck characters including Grandma Duck and Donald’s infamous nephews Huey, Dewey and Louie. “Disney Legend” Jack Hannah was one of the first creators to put pen to paper for Disney Comics in the late 1930’s. After many successful collaborations with other legendary Disney creators, Hannah went on to direct more than 100 animated Disney cartoon films and shorts. Okay, vi er nu nået frem til den konklusion, at der må være tale om genoptryk af de gamle Four Color hæfter fra Dell, og IKKE en Al Talifaferro Intégrale. Sorry. Four Color Series 1 #16 (1941) (Mickey Mouse Outwits The Phantom Blot) - Dell Publishing featuring Mickey Mouse, The Phantom Blot. Four Color Series 2 #129 (1946) (Uncle Remus and His Tales Of Brer Rabbit) - Dell Publishing featuring Uncle Remus, Brer Rabbit, Brer Fox, Brer Bear. Four Color Series 2 #141 (1947) (Mickey Mouse and The Submarine Pirates) - Dell Publishing featuring Mickey Mouse. Four Color Series 2 #157 (1947) (Mickey Mouse And The Beanstalk) - Dell Publishing featuring Mickey Mouse. Four Color Series 2 #170 (1947) (Mickey Mouse on Spook's Island) - Dell Publishing featuring Mickey Mouse.